Care2 Healthy Living | What's a Vegan Diet? When I was 13, I decided to give up poultry and red meat. Although I knew it was because I’d just as soon take a bite out of my own arm, my mom (in a chidingly loving way) claimed it was because I was lazy and didn’t like to chew. (Explain salt water taffy and caramels then, ha, I protested!) Everyone called me a vegetarian, but that confused me because I still ate fish and eggs–and those weren’t vegetables. Vegan, vegetarian, lacto-ovo, raw foodist, fruitarian–what’s it all mean? Is a vegetarian a vegan? Is a vegan a vegetarian? Within the broader category there are a number of sub-classifications. Lacto-ovo-vegetarian: Eats both dairy products and eggs. 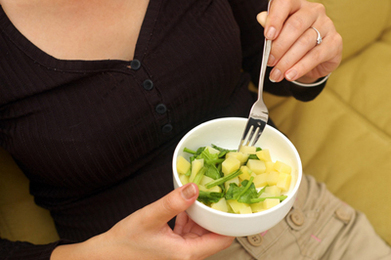 This is the most common type of vegetarian diet. Lacto-vegetarian: Eats dairy products but not eggs. Raw Foodist: Eats 75 percent of their food not heated above 116F degrees. Often vegan, but not always. Fruitarian: Eats only raw fruit, including raw nuts and seeds. Vegan. Does not eat dairy products, eggs, or any other animal product. So in a nutshell, a vegetarian diet excludes flesh, but includes other animal products: A vegan diet is one that excludes all animal products. And I have to say that I have met very few vegans who stop with what they put in their mouths. Most people who adhere to a vegan diet are committed to a vegan lifestyle. This means they do not use anything made with animal products: Down, silk, honey, wool, leather, fur, as well as any products tested on animals. One of the first arguments against a vegan diet is one of nutrition–many people assume the body can only get enough protein, calcium and other minerals through the consumption of animal products. But with a little consideration and a bit of knowledge, nutritional needs can be met without eating meat. Protein requirements can be met with nuts, seeds, legumes, grains, cereals, and soy products. Leafy greens, nuts and seeds, dried fruits and bread provide high amounts of calcium. Iron can be found in leafy greens, wholemeal bread, molasses, dried fruits (especially apricots and figs), lentils and legumes. People gravitate to veganism for various reasons; but its popularity stems from three main reasons–number one being love and respect for animals. Animals raised on factory farms endure horrific living conditions, and most vegans believe that even animals raised with “free-range” and “organic” classifications still suffer. Another reason that people follow a vegan diet has to do with environmental concerns. Take this fact, for example: The world’s cattle alone consume a quantity of food equal to the caloric needs of 8.7 billion people–more than the entire human population on Earth. If we stop feeding all our land’s output to farmed animals, there will be more food for humans to eat. Lastly, some people become vegan for health reasons. For all of these reasons, veganism is a strong movement and continues to increase in popularity. With increased awareness about the environment and animal welfare, it looks like it is a movement poised for continued growth. If you are interested in reading more about transitioning to a vegan diet, visit Vegan Action or Go Veg. Really amazing blog, Iâd love to discover some extra information. Hey, Its really an amazing post. Very informative & Inspiring too. Many people are also choosing ReShape Ready, i am not sure if its safe or not.